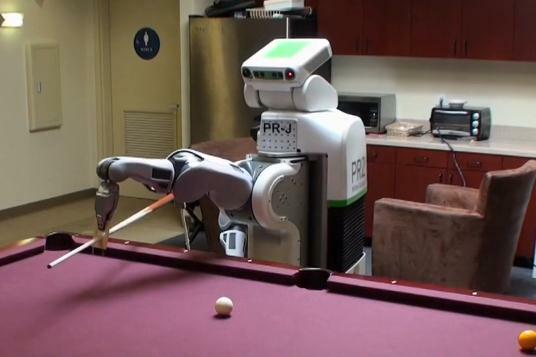 Check out the PR2 robot that has been hacked to play pool. The “Poolshark” team who are working on the project have been busy for a week and have now managed to get the PR2 to pocket shots on the table. This includes long shots and awkward angle shots too. To achieve this the team chose the PR2 robot and modified it to be able to hold the cue along with a special grip and bridge. Cameras mounted on the robot are capable of capturing images which are fed to a computer to detect the edges of the table as well as the location of each ball on the table. By using software the team managed to program the robot and adjust the system so it is capable of playing a game of Pool. A big thanks goes to Alon Altman for his open-source FastFiz billiards library. FastFiz is a physics and rules engine for billiards that the Poolshark team used to select which shots the PR2 should take. The Poolshark team has released its own code in the billiards stack. Check out more details of the project in the video below, or visit Willowgarage for more details.